Home » OUTDOOR » 13 Uber Cool Outdoor Pallet Furniture Ideas Making Your Yard Cozy and Pretty! When it’s about comfort, the outdoor space of your house matters just as much as the interior. And that makes cool, comfy and stunning outdoor furniture a significant something to dress up your home. Wooden pallets are not only strong, but also chic when it comes to working up outdoor sofas, tables and more. Here are 13 uber cool outdoor pallet furniture ideas that will make your yard cozy and of course, pretty. Have you ever seen something so simple yet so uber classy at the same time? 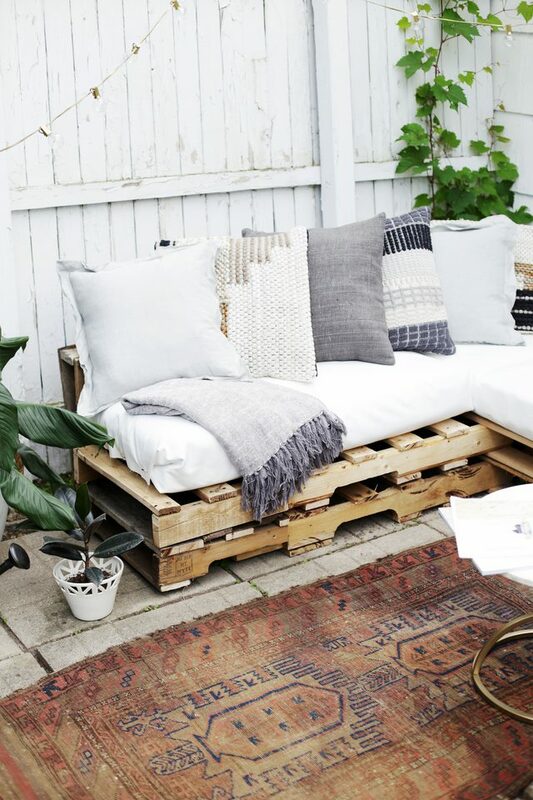 This DIY pallet wood outdoor sofa is the answer! It’s really easy to assemble and looks great in your patio. With a seating capacity of six and separate center and side table, you are destined to have a fun filled get-together and long night conversations. All you require is eight reclaimed pallet wood bases and stack them one against other until you get the setting of your dreams. The weathered paint job adds to a rustic minimalist feel which looks great. You can always play with tints and hues to make it look more homely. Throw in some really fluffy cushions for a soft and comfortable seating to complete the look. Tables can be topped with planters for a more subtle vibe. You will definitely going to enjoy having brunches with your family or inviting guests over for a outdoor dinner. The simplicity of this pallet wood sofa is surely going to look amazing on your patio or backyard. This pallet wood outdoor sofa is surely gonna grab all the gazes and will make your neighbors turn green with envy. If you love the idea of outdoor brunches and snacks with your family or friends, this amazing yet simple DIY outdoor sectional seating is exactly for you. For this, all you need is a bunch of reclaimed pallet wood but you can also use regular wooden panels if you are worried about the pallets structural integrity. To DIY this, you will need few advanced tools and a one whole day to get things done. This idea requires you to make six or seven chairs out of pallet wood without the armrests and arrange them in order fill up that empty space in your backyard. To make things more interesting, you can use colorful and vibrant pillows and cushions for the comfortable seating. You can invite friends over for lunch and watch them drool all over this beautiful outdoor seating you just worked really hard on. The better part is that you can use wood stain similar to your setting and make a seamless installation. Be aware that water can damage the pallet wood so think of a better area to place it to keep them safe. Also, visit the link below for instructions on how to get this DIY done. This pallet wood couch will bring in all the magic and luxury to your backyard. This is the most cost effective and easiest way to turn the empty area around your property into a minimalist classy seating space. The better part is that you can adjust and customize it according to your needs and space. All you need is some heat treated reclaimed wooden pallets and stack them into the shape of your choice. Natural wooden finish adds a country feel to you setting but you can always stain it with the tints that can compliment your backyard. You can place few random sized planters next to the seating structure to give it a little green accent. Cover the leg room with a weathered finished carpet topped with a simple table to add a hue of rustic vibes to your setting. Finally you can throw on some soft pillows and mattress to whole the entire context. There is no doubt that this will be the topic of discussion among your friends and guest and surely, they will be surprised to know that you did it all by yourself. Visit the below given link for the better insight on how to achieve this look. The best part about this next DIY outdoor furniture is that it’s a complete set of sofa with a massive glass table at the center completed with two ottomans. It is a relatively large setup and will require a lot of outdoor space. You will also need carpentry tools and it might take a couple of days to complete, but it will be worth it and it’ll add that urban class and appeal instantly to your backyard. You can choose regular hardware store bought wood over the reclaimed pallet wood if you like. This simple and subtle setting gives a minimalist vibe and will certainly be adored by your guests. You can play around with the wood stain to give it a certain look of your choice and to match with your outdoor surroundings. Finally you can put some thick foam mattress on the top combining with a couple of soft pillows to complete the look. You can certainly change the size and setup to meet the requirements and the area of your backyard. This is the most subtle yet appealing DIY idea out there. All you require is a couple of pallet wood bases and a couple of hours from your time. This outdoor coffee table will instantly add the chic and classy feel your garden. You can start by stacking the pallet wood bases while keeping in mind the height that you desire for your garden table. You can also fix two pairs of table casters at the bottom corners for easy movement. Now comes main part and it’s a tricky one! You need to cover the top of the table with cedar planking while maintaining the aesthetics. At first it seems like a tough job but it’s nothing more than keeping a square perfect and all this hard work will definitely pay off! This easy to make DIY pallet coffee table will be a great asset to your backyard. You can also tweak the paint job to look rough to add instant rustic feel to it. Finally combine your trophy with a couple of comfortable wooden chairs to finish the look. Visit the link below to know more about the DIY process. This particular DIY idea is more of a garden decor rather than an outdoor furniture, but we are still using it for this article as it utilizes reclaimed pallet wood and who doesn’t love to make some nifty use of it. To work on this idea you will be needing some heat treated pallet wood, four large eye hooks, metal chain, plastic planters and a couple of hours from your busy routine. Basically all you have to build is a ladder like structure from the pallets. You can also stain the wood with a hue you like! A couple of hooks here and there and voila! You are done! It’s easier being said than done but it will be worth all the effort you will put into it. This aesthetically pleasing vertical garden will add colorful vibes instantly to your backyard. You can choose from variety of planters to go with the pallet setup. Also go for colorful pots for the vertical garden as they will pop up the whole outdoor. Visit the link below for the detailed instructions on how to make a DIY vertical garden.